What a significant week this has proven to be, with the COP21 proceedings making some historical progress in addressing climate-change issues. The keynote address, delivered by HRH The Prince of Wales, eloquently summarized the major climate-related issues needing international attention, including adopting systematic plans undertaking effective measures as soon as possible. 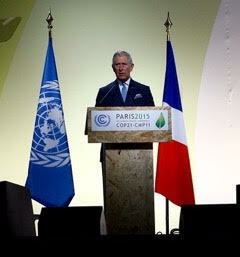 In place of my normal commentary—and rather than summarizing his inspiring talk—I urge you to read the transcript and/or view the video presentation: A Speech By HRH The Prince Of Wales At The COP21 Session, Paris. > The Great Change: Paris Scherzo (Albert Bates). The math is clear: there is a fossil fuel bubble. There is more coal and oil in the ground than we can safely burn [but it is a finite resource]. In this framing, the Paris climate conference is really an economic conference, perched on the brink of a market crash in the fossil fuel sector. The solution is to leave the fuel in the ground, and set up a price signal to allow a managed retreat from an obsolete industry, and protect the public by sending climate dividends back to households. > Common Dreams: La Grande Négociation: While We Bargain, Our Ultimate Fate Comes Down To Acceptance (Asher Miller). As a society, we’re still stuck in the bargaining phase of Kübler-Ross’s Stages of Grief. Yes, there’s actual bargaining taking place between climate negotiators at COP21. But I’m talking about a larger, more systemic bargaining that’s occurring: Our attempts to respond to the existential threat of climate change while holding desperately to our extractive, growth-and-consumption-based way of life. But as PCI Fellow Bill McKibben likes to say, “Physics and chemistry don’t bargain.” Ultimately, we have no choice but to move from the bargaining stage of grief to that of acceptance. The choice we do have is what grief we’ll have to accept – the end of the American-style “way of life” or the end of humanity altogether. > Resilience: A Missing Item on the COP21 Climate Agenda: Grieving (Robert Jansen). Even if pledges for emission reductions being discussed by world leaders were to be achieved, we are going to see potentially catastrophic global warming by the end of this century, and likely far earlier. And climate disruption is only one part of the story of ecological degradation. Predictions are a fool’s game, but look at any critical measure of the health of the ecosphere on which our lives depend, and ask a simple question: Are we heading in the right direction? If we want to begin shaping a livable future, we should start grieving, collectively, for what we have lost and likely will lose. Grieving is not surrender but an acceptance of what can’t be changed and a commitment to what can be accomplished, within limits the ecosphere sets. > On Earth: Arc De Triomphe –The Best-And-Worst Case Outcomes For The Paris Climate Talks (Brian Palmer). Here are three possible Paris outcomes, from best to worst. Look for elements of these scenarios in whatever emerges from the conference, and you’ll be able to confidently opine on the success or failure of the talks: 1) outright success; 2) acceptable middle ground; and 3) try again. > The Guardian: Paris Climate Talks: What Difference Will Temperature Rises Really Make? (Adam Vaughn). Without action, climate scientists have warned that temperatures could rise by nearly 5C above pre-industrial levels by 2100. World leaders meeting in Paris hope to keep average global surface temperature rises below 2C – but their pledges to cut emissions could still see up to 3C according to analyses. While it is very hard to make firm predictions, here are some of the potential impacts. All are for possible temperature rises occurring by 2100. > CNN: Global Climate Change Draft Agreement Reached (Greg Botelho). Negotiators from 195 countries agreed Saturday on a blueprint deal aimed at reducing global carbon emissions and limiting global warming, a significant but far from conclusive step in the multinational effort to keep climate change in check. The United Nations Framework Convention on Climate Change (UNFCCC) posted on its website a copy of the draft agreement, which officials have been working on intensively for some time. The document addresses deforestation, food security, poverty and a host of other issues, with chunks of the document focused on what developed countries can do to reduce carbon dioxide missions by a yet to be determined level by 2050. > Energy Desk-Greenpeace: COP21: What’s Going On With Fossil Fuels Around The World (Zachary Davies Boren). Here’s a roundup of what’s happening on the fossil fuel front heading into the second week of COP, from Europe to the rest of the world. > Sydney Morning Herald: Should You Go Outside Today? Live Map Of World Air Pollution Launched (Catherine Armitage). A start-up company has used the Paris climate change talks to launch a live map of air pollution around the world which it says will help people protect their health and policy makers clear the air. A website and mobile phone app lets you check hour-by-hour on whether exercising and eating outdoors or taking a baby outside is a good idea. Plume Labs’ world air map estimates hourly air pollution levels in over 200 metropolitan areas around the world using half a million pieces of data from 11,000 measurement stations. > The Guardian: World’s Richest 10% Produce Half Of Global Carbon Emissions, Says Oxfam Report . The richest 10% of people produce half of Earth’s climate-harming fossil-fuel emissions, while the poorest half contribute a mere 10%, British charity Oxfam said in a report released Wednesday. Oxfam published the numbers as negotiators from 195 countries met in Paris to wrangle over a climate rescue pact. Disputes over how to share responsibility for curbing greenhouse-gas emissions and aiding climate-vulnerable countries are among the thorniest and longest-running issues in the 25-year-old UN climate process. > ABC News: AP Poll: Ecology, Religion A Natural Mix For Some Americans (Connie Cass & Emily Swanson). As a group, the most religious Americans are less likely than others in the U.S. to trust the science of global warming. Yet one group of faithful Americans–the “Religious Greens”–not only believes the threat is real, but also feels obliged to help save Earth’s climate, an analysis by the Associated Press-NORC Center for Public Affairs Research and Yale University shows. 9 in 10 of their members believe global warming is happening, and 7 in 10 believe the environmental crisis is more serious than most people think. They also tend to support environmentally friendly policies. > Ensia: Tiny Materials In Countless Products Raise Big Questions For Environment And Health (Elizabeth Grossman). Working at the nanoscale — which can mean the near-atomic scale, with substances a million times shorter than the length of an ant, a thousand times thinner than human hair — brings the ability to create new materials that can perform tasks in ways that might not otherwise be possible. But it also brings new concerns and challenges related to understanding environmental and human health impacts, because at the nanoscale, substances often take on chemical, biological and physical properties they might not otherwise have and behave in ways they might not at conventional sizes. > The Guardian: Earth Has Lost A Third Of Arable Land In Past 40 Years (Oliver Milman). The world has lost a third of its arable land due to erosion or pollution in the past 40 years, with potentially disastrous consequences as global demand for food soars, scientists have warned. New research has calculated that nearly 33% of the world’s adequate or high-quality food-producing land has been lost at a rate that far outstrips the pace of natural processes to replace diminished soil. > Other Words: Have We Hit Peak Inequality? (Chuck Collins). The richest 20 individuals alone own more wealth than the entire bottom half of the U.S. population. This group — which includes Gates, Warren Buffet, the Koch brothers, Mark Zuckerberg, and Google co-founders Larry Page and Sergey Brin, among others — is small enough to fit on a private jet. But together they’ve hoarded as much wealth as 152 million of their fellow Americans. Many of the richest 400 Americans amassed their wealth through successful companies and innovation. But they’ve all benefited enormously from a system of trade, tax, and regulatory rules tipped in favor of the wealthy at the expense of wage earners. > CNN Money: America’s Poor Are Still Heavily In Debt (Heather Long). About 1 in 5 American families who make $41,200 or less have what’s considered a hefty debt burden — defined as more than 40% debt-to-income load. So a lot of America still is massively in debt, especially in the lower rungs of the income ladder. Wealthy families have been able to pay off a lot of their debt in recent years, but poorer families have not. The situation is so bad that Morgan Stanley (MS) says the middle class is “eroding.” Too many people have high debt burdens. It’s a trap they just can’t get out of. Wages aren’t growing for those at the bottom, making it hard to pay off debt. > Yes! Magazine: COP21: How To Ramp Down Fossil Fuels Fast—Without Leaving People Behind (Kate Aronoff). The concept of energy democracy is rooted in calls for democratic rights, a well-funded public sphere, and renewable energy. According to the International Labor Organization, a just transition away from fossil fuels and toward a greener economy means the process must include all stakeholders: The inevitable impacts on society and jobs must be shared by all of us. Circumventing the old trope of jobs versus the environment, the energy democracy framework treats the climate crisis as a chance to create better jobs and rebuild the public sphere in places wracked by austerity. > NPR-MPR: Bill Gates And Other Billionaires Pledge To Take On Climate Change (Marilyn Geewax). 28 private investors, including Microsoft’s Bill Gates, Facebook’s Mark Zuckerberg and Amazon’s Jeff Bezos, pledged $7 billion of their own money to help build private businesses based on that public research for “clean energy”. Gates and his fellow billionaires will offer early-stage capital for technologies with long-term potential to generate clean energy. Gates said he is “optimistic that we can invent the tools we need” to fight climate change. Despite their own comfortable lives, “these are investors who care about clean energy and cheap energy,” Gates said. > Sustainable Cities: Indiana Urban Farm Takes Whole Lifestyle Approach To Local Food (AJ Hughes). The phrases “grow well, eat well, live well, be well” adorn the website of Indianapolis urban farm Growing Places Indy, which uses food to help people find more wholeness in their lives. For the past seven years, the work of Growing Places Indy has evolved to include a winter farmers’ market, yoga classes, a summer apprenticeship program, educational offerings, and several urban farm sites. > Star Tribune: State’s Largest Solar Array Now Generating Power At Minneapolis-St. Paul Airport (David Shaffer). Minnesota’s largest solar power project is now generating electricity atop two parking ramps at the Minneapolis-St. Paul International Airport. The 3-million-watt system containing 8,705 solar panels went online Tuesday, and is expected to supply 20 percent of the electricity used in Terminal 1 and to cut carbon emissions by nearly 7,000 tons per year, airport officials said. > Sierra Club: Cycling Can Save The World (Paul Rauber). 23% of trips by bikes may be doable, but for most cities it’s still a long way off. (On average in the United States and Canada, only 1 percent of trips are made by bike; the worldwide average is 6 percent.) How to get from here to there? The authors say it will take some major policy changes at various levels of government. Some are what you might expect (implement bike-sharing programs where they don’t already exist, repeal policies that encourage motor vehicle use, like fuel subsidies and free on-street parking), while others are less so. For example, the authors recommend a major role for electric bicycles or e-bikes, and safe bike lanes. > Resilience: Retrotopia: Economics by Other Means (John Michael Greer). This is the tenth installment of an exploration of some of the possible futures discussed on this blog, using the toolkit of narrative fiction. Our narrator catches a train for the agricultural hinterlands of the Lakeland Republic, and learns some of the reasons why the Republic is so hard to invade. > Conservation Minnesota: Minnesota Retailers Help Consumers. Conservation Minnesota is part of a nationwide effort called Mind the Store that urges our largest retailers to use their market clout to eliminate the worst chemicals in the products they sell. These chemicals are associated with increased risks of reproductive and developmental problems, cancer, and other health conditions. We are happy to report that these Minnesota companies, like Target and Best Buy, are moving forward on the path to safer chemicals and sustainable products. > Citizens for Sustainability: Discussion Forum & Electronic Recycling Presentation (by SAV Area FIRST (For Inspiration and Recognition of Science and Technology) LEGO League Team #17760), Sat., Dec. 12, 11am-1pm, St. Anthony Village Community Center, Silver Lake Rd. > Minnesotans for Fair Economy: MFE People’s Congress – United For A Fair Economy, Dec. 12, 11:00am – 5:00pm (lunch will be served), Minneapolis Convention Center, 1301 2nd Ave South, Mpls. Childcare Available!